ANDY MURRAY SAYS he will “most likely” make his return to grand slam action at Wimbledon on Tuesday. Murray has not contested a slam since his defeat to Sam Querrey in last year’s quarter-finals at SW19, the former world number one subsequently undergoing surgery on a long-standing hip problem. He made his return to the ATP Tour at Queen’s Club last week, losing to Nick Kyrgios in three sets, before this week beating Stan Wawrinka in straight sets and then suffering defeat to Kyle Edmund in the same manner at Eastbourne. The two-time Wimbledon champion was expected to announce whether he will play at the All England Club prior to today’s draw, but couldn’t provide definitive confirmation before being drawn against Benoit Paire in round one. 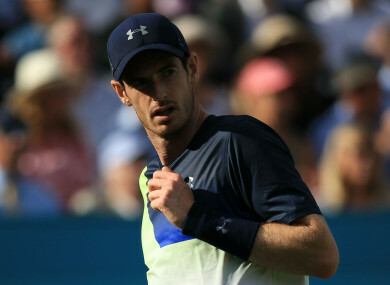 However, speaking to reporters after practicing at All England club, Murray said: “I feel alright, not much different to how I felt two days ago really. “I’ll chat to my team this afternoon and also see a bit how the next two days go. I’m playing sets and stuff (tomorrow), and then, most likely yeah, I’ll play. Asked if the draw had been kind to him, given he could have played world number one Roger Federer in the first round, Murray said: “I guess I could have played one of the top players in the world but at this stage of where I’m at playing Paire in the first round is tricky for me. Murray will have the benefit of an extra day’s rest if he competes at Wimbledon, his clash with Paire scheduled for Tuesday. Email “Andy Murray hoping to avoid hip flare-up and make grand slam return at Wimbledon”. Feedback on “Andy Murray hoping to avoid hip flare-up and make grand slam return at Wimbledon”.